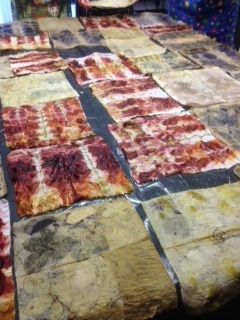 One day workshop working with both fabric and paper. 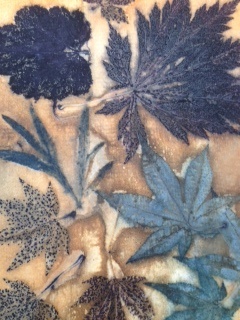 Using a selection of different fabrics and papers, participants will learn about the process of Eco printing, the types of leaves which produce the best results and the different ways in which the leaves can be processed. They will have the opportunity to work with a variety of mordants which can radically alter the outcomes of the prints. A selection of papers and approximately I metre of white/cream fabric made of an animal fibre eg silk or wool. I can provide for sale at cost. hello. we were wondering if there were any spaces left on the course eco printing for the 21 oct, it will be for myself and my daughter. enrol for the course you were starting as i would have missed 2 lessons. My only concern is the time it finishes as i will need to pick up my son from southampton for 4 ish. also a friend said she would be interested.